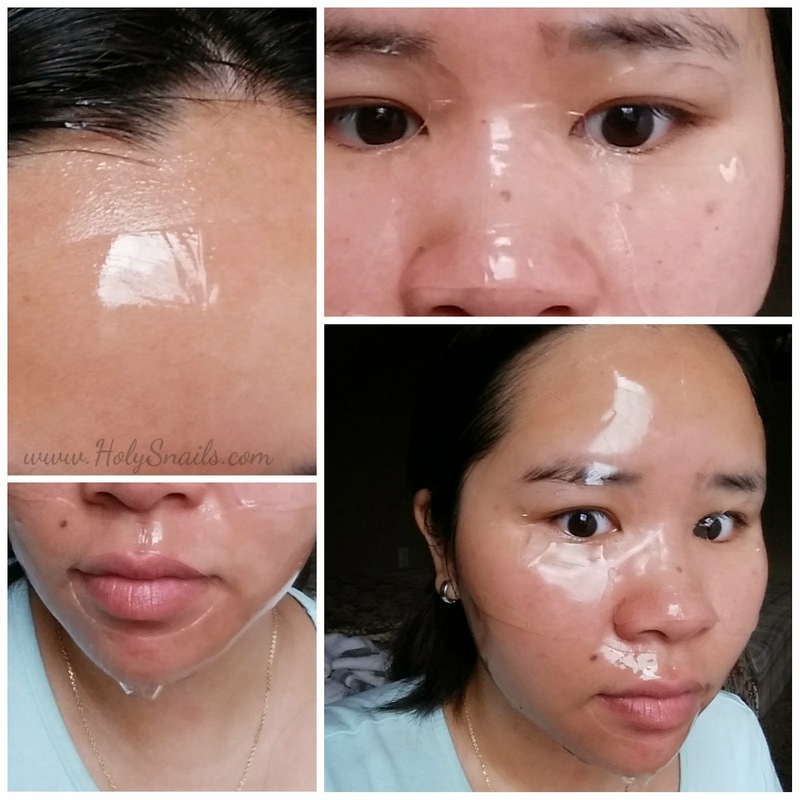 Whamisa Seeds & Rice Fermented Hydrogel Facial Mask | Holy Snails! Yesssss, one of my higher end hydrogels. I'm turning into a hydrogel addict, and hoarding everything I can find. This is actually one of my favorites, despite some flaws. 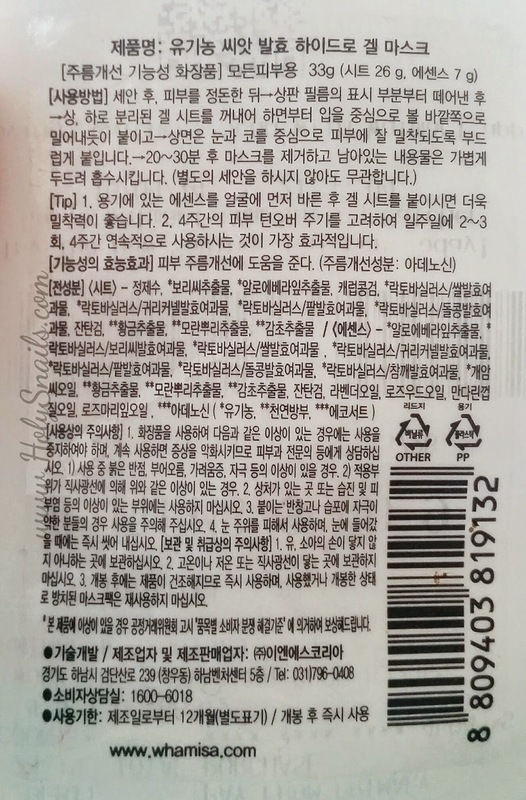 Warning, this is actually a really long review for a sheet mask, almost as long as one of my regular product reviews. 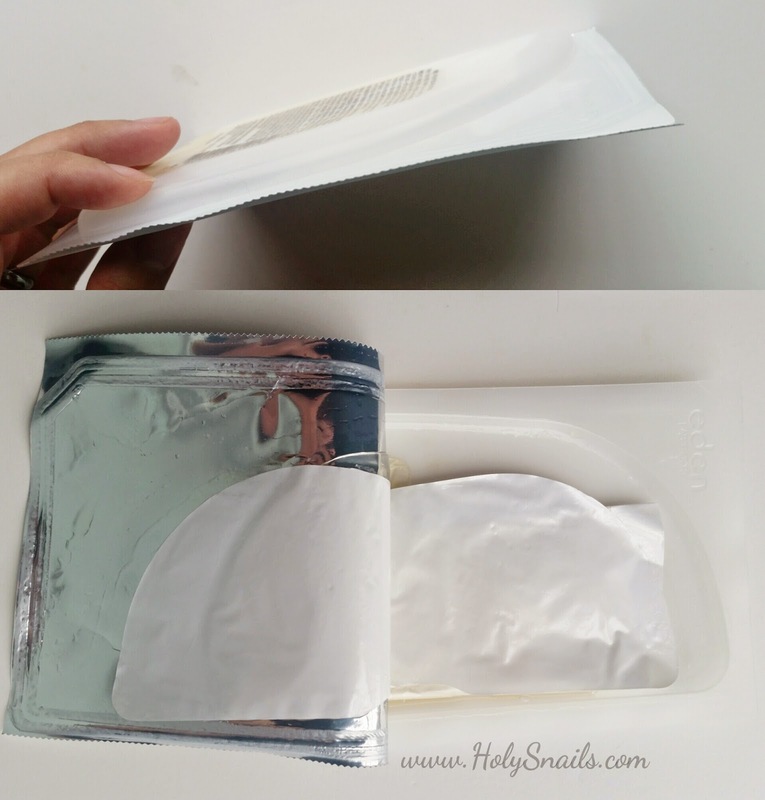 As you can see, the packaging is a little different from your standard sheet mask - or even your standard hydrogel, which come in nicer looking foil packets. This is more like a little tray, and is much thicker than the typical sheet mask packaging. This does an excellent job of protecting the very fragile hydrogel inside. Did I say fragile yet? It's very delicate. And slimy and slippery and difficult. This is not a beginner sheet mask, which...is a Thing now. It comes in two very wet pieces, and is all folded up so is a bit of a pain to open and prep before it even gets on your face. 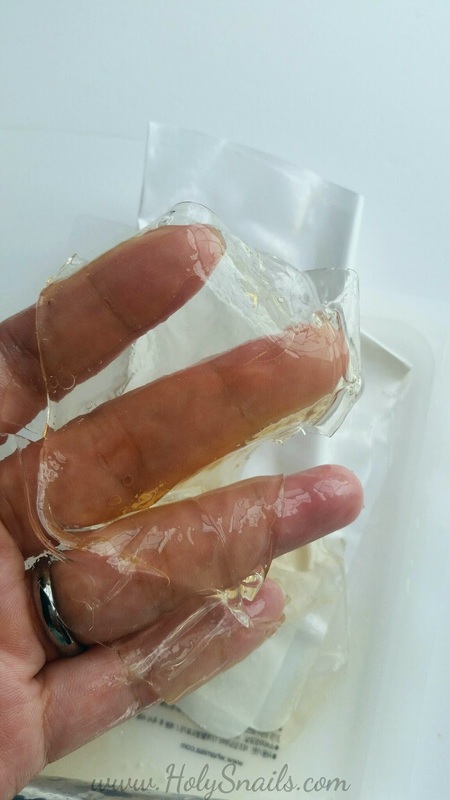 This type of hydrogel mask does not have any type of mesh support, similar to the Leaders Coconut Gel Masks. Don't let that discourage you from trying it out though, because this is worlds better than those desert dry face condoms. In fact, that's even part of the problem. When trying out new masks, I typically put them on, wait for 5 minutes, and then put on my Daiso Sheet Mask Cover. I do this so I can determine how well the mask fits on my face and adheres without assistance. This mask was so wet that after I put on the top half, as I'm unfolding the bottom half to put on, the top half slid down my face and covered up my eyes (the whole forehead portion of the mask), rendering me rather useless for a good minute while I struggled to readjust it and regain vision. After I got the bottom part on, I had to then juggle between the two to keep them actually on my face while I ran for the bed so I could stop fighting gravity. The fit is really not that great for me. A lot of it dangled under my chin, and only covered like half of my forehead. Also, the way the eye holes were cut, no matter what I did, it kept covering the inside third of my eyes. 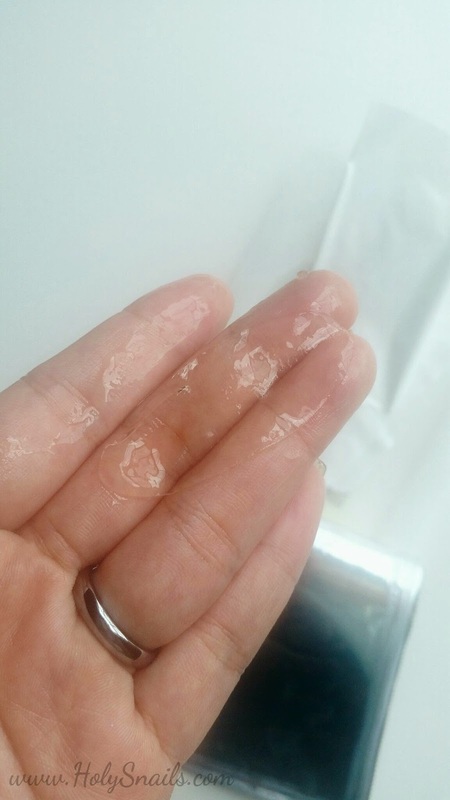 Despite being a hydrogel, which typically fit my face like a second skin, it kept lifting away from the sides of my nose, which was really annoying and I had to keep pressing it back down. This little sliver was inside the packaging, all folded up. I'm assuming it's the mouth part. Maybe you're suppose to lay it over your lips like those funky lip sheet masks? Either way, only half of my forehead was getting coverage, so I used this to cover what little I could up there. Please do not just copy the ingredients list to your blog. Please link back to here instead. It takes a lot of work to translate! Nothing was flagged by CosDNA, but this does contain essential oils. It has a lot of fermented ingredients, which are suppose to be more readily usable by your skin. This contains a lot of anti-inflammatory and emollient ingredients. I'm not sure why it repeats some stuff, unless they were just pointing out highlights of the mask, but I figured I'd copy it exactly as it was listed. I'll tell you right now, I will be rebuying these as often as I can. Because wow, even with all the slippery, poor fitting craziness, this mask is amazing. It made my skin feel so glowy, soft, and even, and that wasn't just a couple of hours. It lasted over 24 hours later! Just amazing. Also, from the moment I cracked open the packaging, I was in a cloud of heavenly jasmine - which is weird, as jasmine isn't mentioned anywhere in the ingredients list, but that's what it smells like (maybe the rosewood oil?). The smell lingers after the sheet mask for a good hour at least, and it's so lovely. I bought this off a Facebook group for $2, as it was nearing expiration (5/31/15), and this lovely ABer didn't think she could use them all up in time. These are typically sold for around $9, which makes them super luxe for a sheet mask. 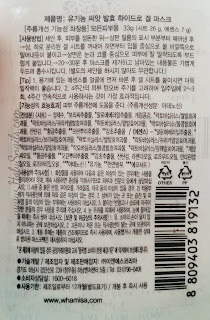 However, the Korean Whamisa website often marks them down when they near expiration. They currently have them for $0.99 each, and are also available in packs of 10, which is just a jawdroppingly amazing deal. You'll just have to go through Avecko or Gmarket to get them. I can't recommend this enough. Everyone really needs to try at least one of these masks. They're a little finicky, but the way I see it (Nerd: ON) it's like working with fine silk yarn vs. regular acrylic yarn, if anyone's familiar with knitting/crocheting/etc. It's a pain in the bum to work with, and it's not as easy to take care of as the cheaper stuff, but the results are unparalleled, and the experience is unforgettable.